Monsoon season is here, and this year, the Arizona Department of Transportation (ADOT) wants to be prepared after last years disastrous season. In 2014, a record breaking 3.29 inches of rain fell in Phoenix in one day. It was considered the wettest day on record since 1895. On average, rainfall during the entire monsoon season is 2.71 inches. Dozens of people were injured during monsoon season in automobile and personal injury accidents. If you or someone you love has been hurt as a result of another individuals negligence, you may be entitled to compensation. For a free review of your claim, call or text 1-800-706-3000 and let a personal injury lawyer from our law firm review the details of your incident. 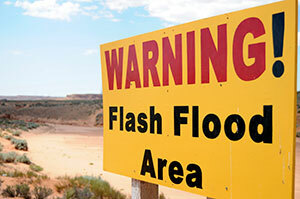 One of the main hazards associated with monsoon season is flooding, specifically flash flooding. Rainfall during monsoon season is heavy and does not soak into the ground easily, which leads to large amounts of flooding. The Phoenix Streets Department has been working to trim trees and secure equipment should a sudden storm arise. Last years storms made the Streets Department realize that having signs and equipment stored in different areas of the city would be helpful. Additionally, new equipment will make it easier and quicker to build makeshift dams along roadways to keep the water out. If a driver encounters a light that has gone out during a storm, the intersection should be treated like a four-way stop while the light is out. Drivers are also being encouraged to Pull Aside, Stay Alive, a campaign focusing on dust storms. During monsoon season, drivers are much more likely to suddenly be caught in a dust storm. The ADOT encourages drivers to pull over, turn off all vehicle lights, set the emergency brake, and stay in the vehicle with a seatbelt on until the storm passes. If you or someone you love is injured in a wreck this monsoon season, contact the car accident lawyers with the experience you need to fight for your rights. Contact Phillips Law Group by calling or texting 1-800-706-3000 or filling out a free case review.